Tomura (Yosuke Eguchi) was once widely lauded as a legendary patissier, but some 8 years ago he inexplicably left the field. Since that time, Tomura has lectured at culinary schools and wrote a guidebook for pastry critics. Natsume (Yu Aoi) is a young woman who travels from Kagoshima to Tokyo to find her boyfriend. 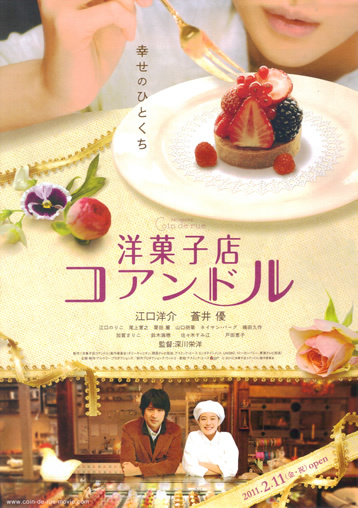 Natsume fins a job at "Patisserie Coin de rue" - a pastry shop run by husband & wife tandem Yuriko (Keiko Toda) and Julian (Nathan Berg). At "Patisserie Coin de rue" Natsume works with talented patissier Mariko (Noriko Eguchi) & her fascinating creations. Ki Jun 10 2012 11:25 pm Can't wait to watch this yu chan is so kawaii!